MUMBAI (Reuters) - Samsung Electronics expects a new range of smartphones it will launch in India in the first half of this year to generate sales of $4 billion in 2019, a senior company executive said on Thursday. 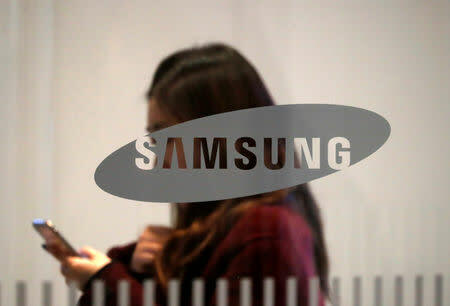 The South Korean giant will unveil one smartphone from the Galaxy A series every month beginning in March, through June, Ranjivjit Singh, Samsung India's chief marketing officer, told Reuters in a telephone interview. The phones, targeted at millennials, will be priced between 10,000 rupees ($141) to 50,000 rupees ($703), he said, without specifying details. "This is going to be really big ... We're talking about (sales) in the range of $4 billion in this year, in terms of just the Galaxy A series," Singh said. Samsung's mobile phone sales in India hit 373.5 billion rupees in the year to end-March 2018, according to regulatory filings sourced by paper.vc, a business intelligence platform. India, the world's second-biggest mobile phone market, will be among the first few geographies where new A series phones, comprising more than four devices, will be launched, Singh said. With more than a billion wireless subscribers and roughly 350 million users still on basic feature phones, India is a big prize for Samsung to lose, having learned harsh lessons in China, where it has lost market share. It uses its research and development center in the southern tech hub of Bengaluru, Sasmung's biggest such unit outside South Korea, to drive innovations for the local market. "I can assure you the Galaxy A series has very strong input coming in from this team," Singh said. The company has also been focused on India after facing intense competition from Chinese rivals such as Xiaomi Corp, Oppo and Vivo. Samsung, which locally assembles all phones it sells in India, ended 2018 with 24 percent share of the Indian market by shipments, behind Xiaomi's 28 percent, according to Hong Kong-based tech researcher Counterpoint. Last month it launched a budget smartphone series in India, which it sells online through Amazon India and its own website, ahead of a global launch. In 2018, it opened what it said was the world's biggest mobile phone manufacturing plant on the outskirts of New Delhi as well as its biggest mobile phone store globally in Bengaluru.